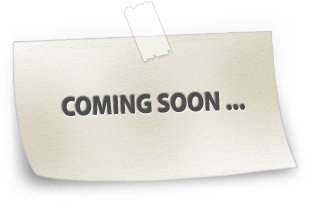 Welcome to HSS Exhibition page. Here we list all different exhibitions done by HSS in USA. This exhibition is a bird's eye view of the vast Hindu cultural heritage and the Dharmic traditions of India. Thank you for taking the time to review the textual content for the posters. Audience: Do you think the content will be appealing and inspiring to young Americans? Order: Do you think the order of the posters is correct? Any changes that you suggest? Do not hesitate to suggest changes or to rephrase the sentences. 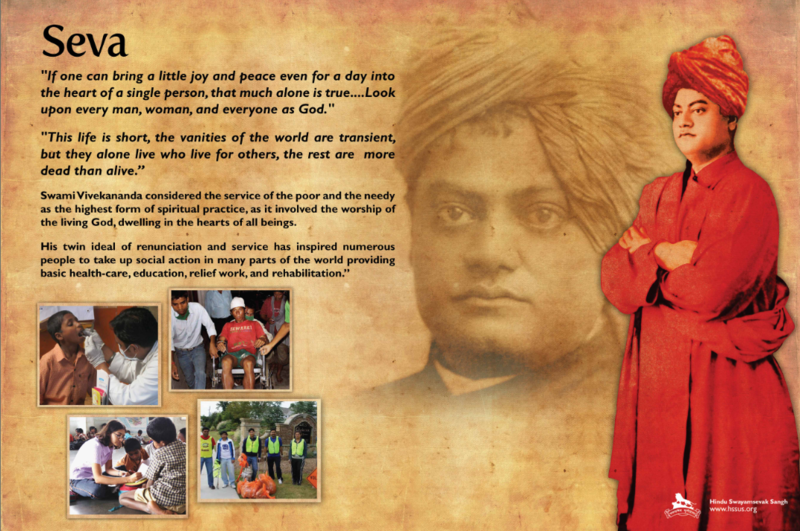 The exhibition aims at presenting and popularizing the life and the message of Swami Vivekananda in America. Audience: The exhibition would focus in particular on youngsters including teenagers, University students and young professionals; Hindu Americans and spiritually inclined people. Setting: The exhibition is proposed to be put up in Universities, Public Libraries, Temples, Parks, State Capital Buildings and other public places across America. The aesthetics, the look and feel and the content should be attractive. The poster should be depicted in simple words and should be easy to understand. The reading time of the text in each poster should not be more than 45 seconds. There should be a thematic continuity between individual posters. The poster should be relevant even after the 150 year celebrations. The packing should ensure no damage during assembling, dis-assembling and transportation. The exhibition setup should be suitable for both indoor and outdoor settings. The sequencing of the posters should be easily identifiable through enumeration on the back of each poster. The monk who took Yoga to the masses of America. 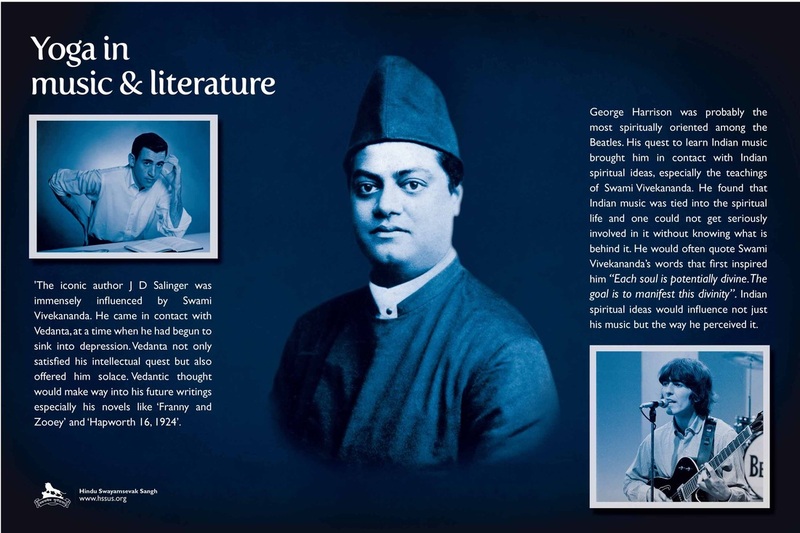 The spiritual leader who touched the lives of J D Salinger, Nikola Tesla, John D Rockefeller and many others. The philosopher who built bridges between the East and the West and between Science and Spirituality. 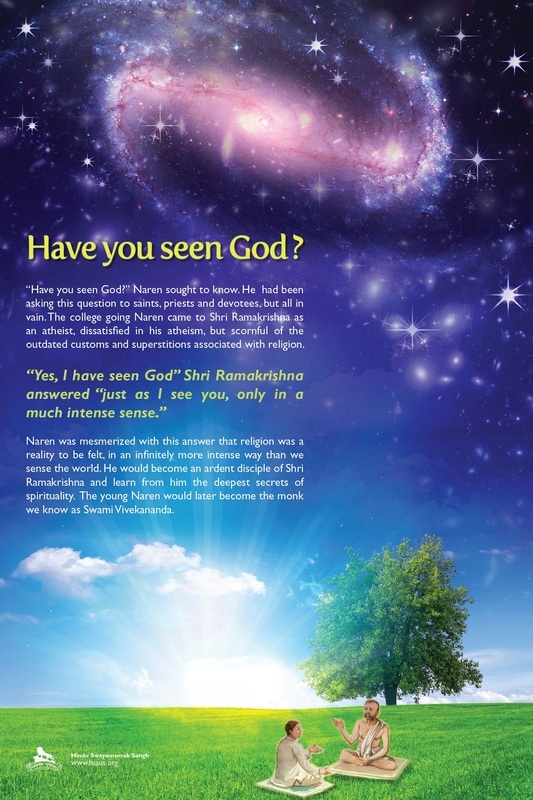 “Have you seen God?” Naren sought to know. He had been asking this question to saints, priests and devotees, but all in vain. The college going Naren came to Shri Ramakrishna as an atheist, dissatisfied in his atheism, but scornful of the outdated customs and superstitions associated with religion. Naren was mesmerized with this answer that religion was a reality to be felt, in an infinitely more intense way than we sense the world. 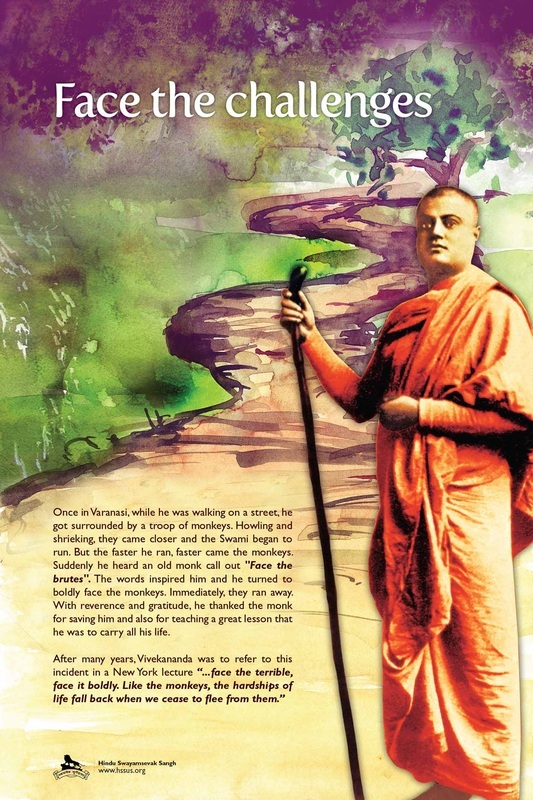 He would become an ardent disciple of Shri Ramakrishna and learn from him the deepest secrets of spirituality. 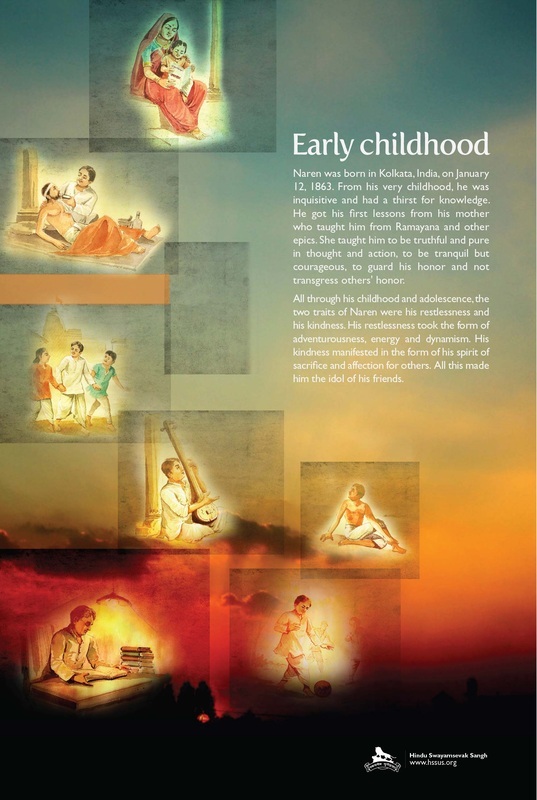 The young Naren would later become the monk we know as Swami Vivekananda. Naren was born in Kolkata, India, on January 12, 1863. From his very childhood, he was inquisitive and had a thirst for knowledge. He got his first lessons from his mother who taught him from Ramayana and other epics. She taught him to be truthful and pure in thought and action, to be tranquil but courageous, to guard his honor and not transgress others' honor. All through his childhood and adolescence, the two traits of Naren were his restlessness and his kindness. His restlessness took the form of adventurousness, energy and dynamism. His kindness manifested in the form of his spirit of sacrifice and affection for others. All this made him the idol of his friends. During his school days, Naren and his friends would climb a tree and play swinging on its branches. One day, an elderly person who heard these boys shout, came there and admonished them. To dissuade them from climbing the tree, he told them that it was a 'forbidden tree' with a ghost wandering about it. All boys except Naren were frightened and got off the tree. Many years later, as Swami Vivekananda, he would tell large audiences "Do not believe a thing because you read it in a book! Do not believe a thing because another had said it so! Find out the truth for yourself! That is realization!" Through his college days, Naren became increasingly restless with religion. Primarily because he believed that if there was God, one should be able to experience him. He rejected practices that could not stand the scrutiny of reason. When he met Ramakrishna, his spontaneity, purity of mind and renunciation greatly impressed Naren. But he remained skeptical of everything that Ramakrishna told him. Naren tested his Guru in various ways, and asked him challenging questions. Shri Ramakrishna, with his infinite patience and compassion, guided him gradually, into the deepest secrets of spirituality. 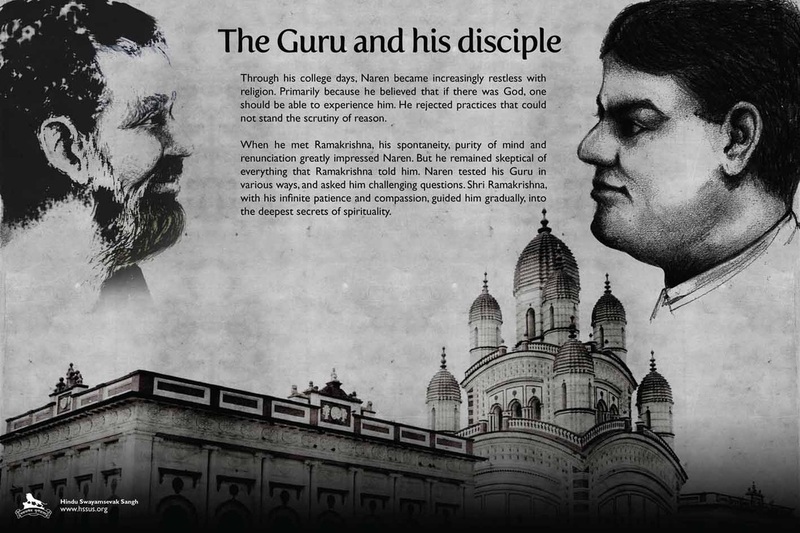 After the death of Shri Ramakrishna, Naren and many of his fellow disciples took to monasticism. For a brief period he lived in a monastery but soon felt a strong urge to experience the life of a wandering monk. 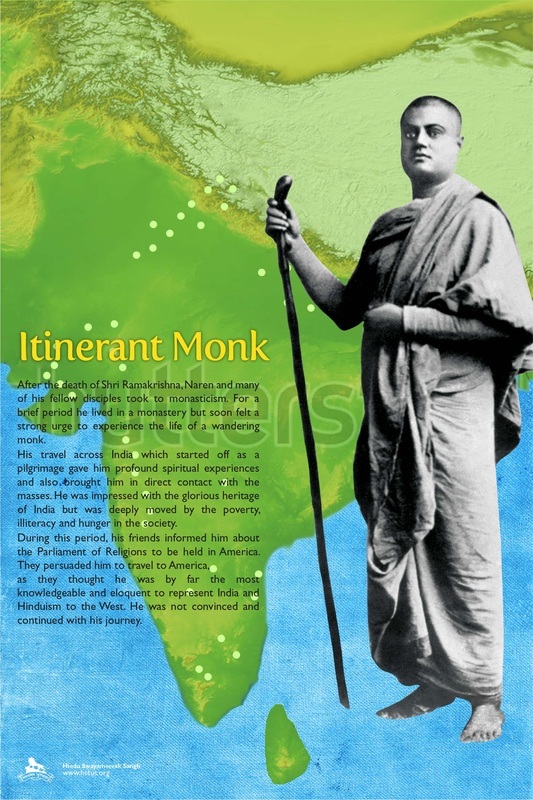 His travel across India which started off as a pilgrimage gave him profound spiritual experiences and also brought him in direct contact with the masses. He was impressed with the glorious heritage of India but was deeply moved by the poverty, illiteracy and hunger in the society. During this period, his friends informed him about the Parliament of Religions to be held in America. They persuaded him to travel to America, as they thought he was by far the most knowledgeable and eloquent to represent India and Hinduism to the West. He was not convinced and continued with his journey. Once in Varanasi, while he was walking on a street, he got surrounded by a troop of monkeys. Howling and shrieking, they came closer and the Swami began to run. But the faster he ran, faster came the monkeys. Suddenly he heard an old monk call out "Face the brutes". The words inspired him and he turned to boldly face the monkeys. Immediately, they ran away. With reverence and gratitude, he thanked the monk for saving him and also for teaching a great lesson that he was to carry all his life. Overwhelmed by all that he had seen through his journey, Swami Vivekananda reached Kanyakumari at the southernmost tip of mainland India. A rock lay a small distance away from the tip, separated by the shark infested waters of the Indian Ocean at the confluence of three seas. He wanted to go to the rock and meditate but had no money to pay the boatman. Without a second thought, he jumped into the sea and swam to the rock. In America, his attire drew the attention of many a passerby. On multiple occasions, he was pushed around and his turban pulled. Every time he retorted back, gently yet firmly. There were many distressing incidents such as the one when a hostile mob threw things at him. 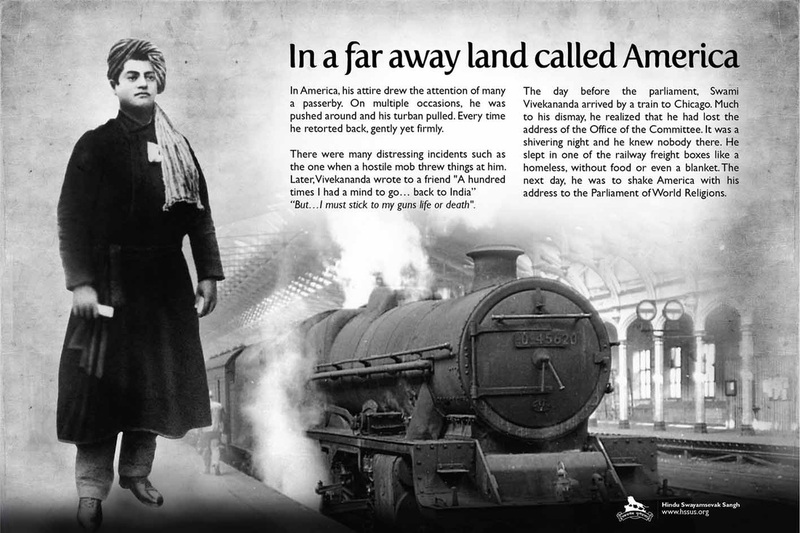 Later, Vivekananda wrote to a friend "A hundred times I had a mind to go… back to India” “But…I must stick to my guns life or death"
The day before the parliament, Swami Vivekananda arrived by a train to Chicago. Much to his dismay, he realized that he had lost the address of the Office of the Committee. It was a shivering night and he knew nobody there. He slept in one of the railway freight boxes like a homeless, without food or even a blanket. The next day, he was to shake America with his address to the Parliament of World Religions. It was 11th September, 1893. 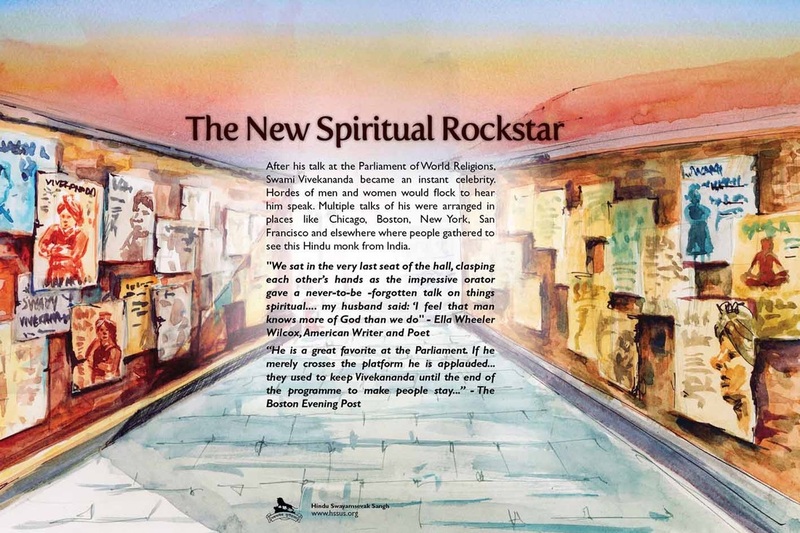 Swami Vivekananda was at the Art Institute of Chicago for the World Parliament of Religions, representing Hinduism. He began his speech, addressing the audience as 'Sisters and Brothers of America'. Instantly, the 7000 strong audience gave a standing ovation for a full two minutes. The spontaneity and the force of conviction in these words connected with their hearts and in a moment transcended all distinctions of race, religion and nationality. In his speech, he stressed upon the spirit of pluralism in Hinduism and told the audience how India, since olden times, has been giving shelter to the religious refugees like Jews and Zoroastrians. The monk cautioned the audience of the dangers posed by religious sectarianism. While others had spoken for their sect alone, Swami Vivekananda spoke of mutual respect and universalism. “…holiness, purity, and charity are not the exclusive possessions of any church in the world, and that every system has produced men and women of the most exalted character. In the face of this evidence, if anybody dreams of the exclusive survival of his own religion and the destruction of the others, I pity him from the bottom of my heart." After his talk at the Parliament of World Religions, Swami Vivekananda became an instant celebrity. Hordes of men and women would flock to hear him speak. Multiple talks of his were arranged in places like Chicago, Boston, New York, San Francisco and elsewhere where people gathered to see this Hindu monk from India. 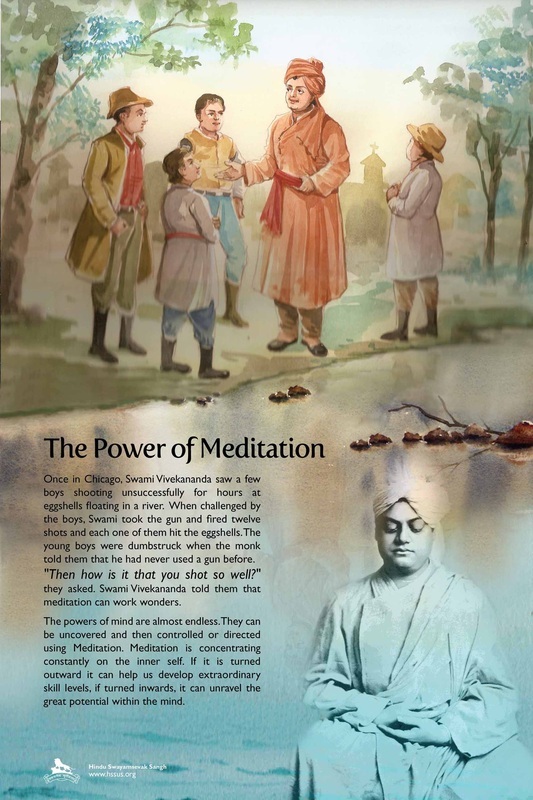 Once in Chicago, Swami Vivekananda saw a few boys shooting unsuccessfully for hours at eggshells floating in a river. When challenged by the boys, Swami took the gun and fired twelve shots and each one of them hit the eggshells. The young boys were dumbstruck when the monk told them that he had never used a gun before. "Then how is it that you shot so well?" they asked. 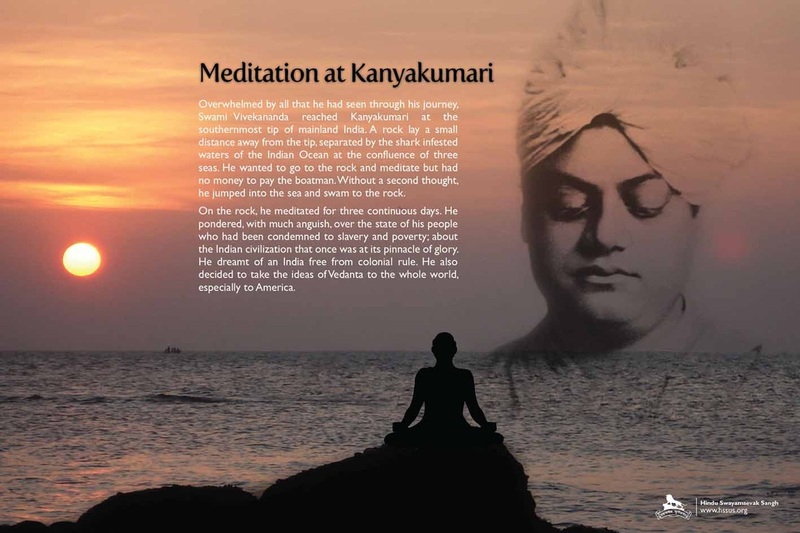 Swami Vivekananda told them that meditation can work wonders. The powers of mind are almost endless. They can be uncovered and then controlled or directed using Meditation. Meditation is concentrating constantly on the inner self. If it is turned outward it can help us develop extraordinary skill levels, if turned inwards, it can unravel the great potential within the mind. "Each soul is potentially divine. The goal is to manifest this Divinity within by controlling nature, external and internal. Do this either by work, or worship, or psychic control, or philosophy -- by one, or more, or all of these -- and be free." 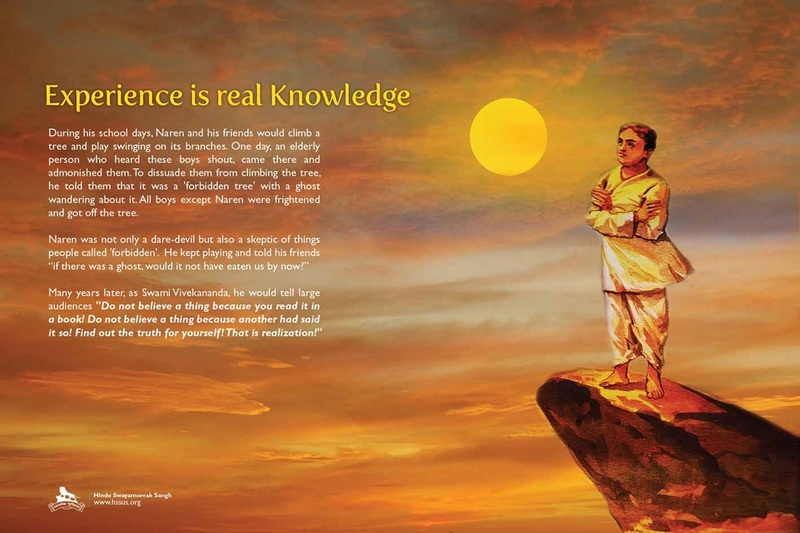 Swami Vivekananda taught the ideas of ancient Hindu texts known as Vedanta. Vedanta believes that each soul is a manifestation of infinite purity, freedom, love, and power. Karma Yoga: Inspired action and selfless work. Bhakti Yoga: Devotion and unconditional love. “Ethics cannot be derived from the mere sanctions of any personage, however great and divine he may have been. That you and I are not only brothers.…but that you and I are really one. This is the dictate of Indian philosophy. This oneness is the rationale of all ethics and spirituality "
Swami Vivekananda believed that we should be ethical because that is our real nature and not because of reasons such as fear of police, fear of public ridicule or fear of God's punishment. The concept of Dharma is based on this principle of being true to one's divine self. It guides us in our interaction with other life forms and nature and helps us live harmoniously with them. For example, when we realize that mother nature is also a manifestation of divinity, it encourages us to respect and nourish her rather than exploit her. "If one can bring a little joy and peace even for a day into the heart of a single person, that much alone is true....Look upon every man, woman, and everyone as God." Swami Vivekananda considered the service of the poor and the needy as the highest form of spiritual practice, as it involved the worship of the living God, dwelling in the hearts of all beings. Swami Vivekananda's personality and intellect had a tremendous sway over prominent Americans of his time. His presentation of ancient Vedantic knowledge in modern scientific terms immensely appealed to many Western thinkers. 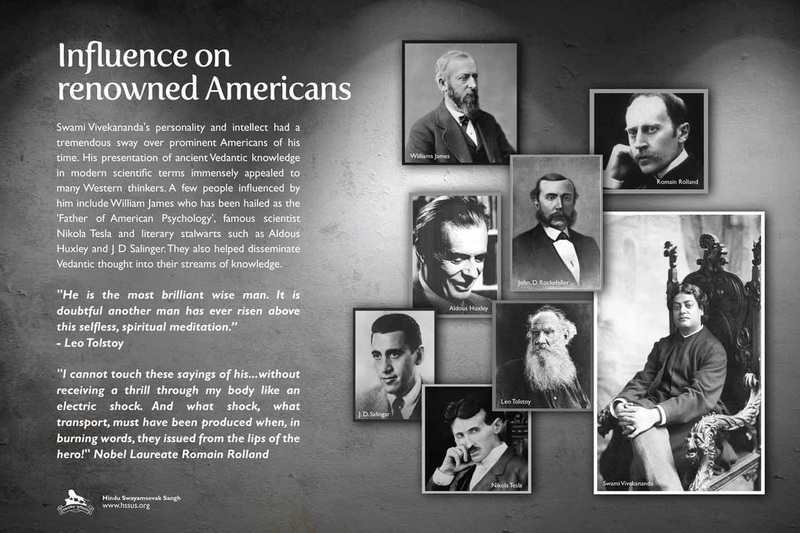 A few people influenced by him include William James who has been hailed as the 'Father of American Psychology', famous scientist Nikola Tesla and literary stalwarts such as Aldous Huxley and J D Salinger. They also helped disseminate Vedantic thought into their streams of knowledge.
' 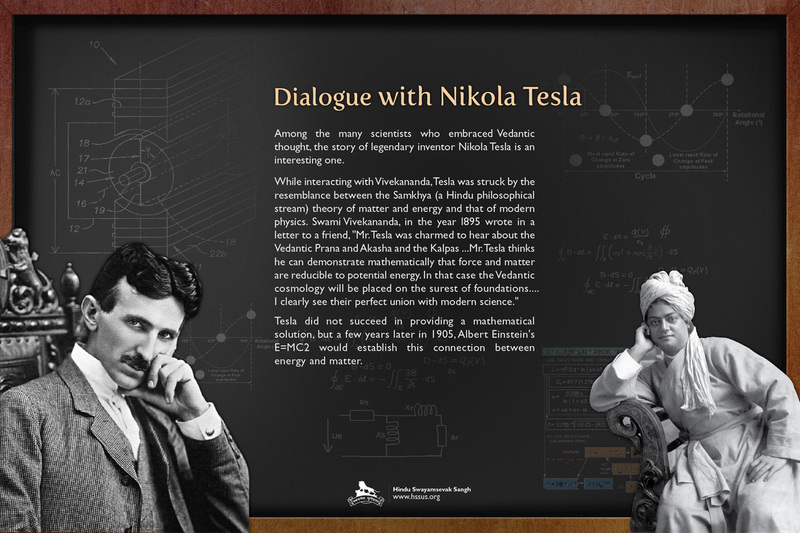 Among the many scientists who embraced Vedantic thought, the story of legendary inventor Nikola Tesla is an interesting one. While interacting with Vivekananda, Tesla was struck by the resemblance between the Samkhya (a Hindu philosophical stream) theory of matter and energy and that of modern physics. Swami Vivekananda, in the year l895 wrote in a letter to a friend, "Mr. Tesla was charmed to hear about the Vedantic Prana and Akasha and the Kalpas ...Mr. Tesla thinks he can demonstrate mathematically that force and matter are reducible to potential energy. In that case the Vedantic cosmology will be placed on the surest of foundations.... I clearly see their perfect union with modern science." 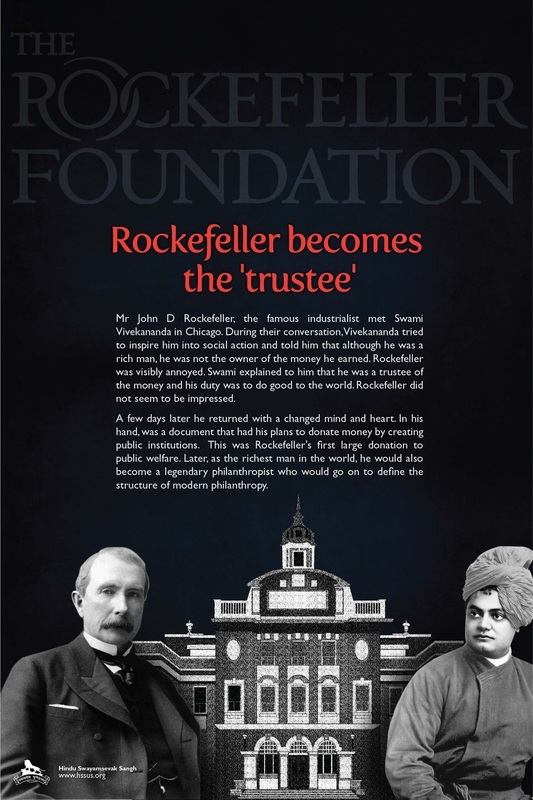 Mr John D Rockefeller, the famous industrialist met Swami Vivekananda in Chicago. During their conversation, Vivekananda tried to inspire him into social action and told him that although he was a rich man, he was not the owner of the money he earned. Rockefeller was visibly annoyed. 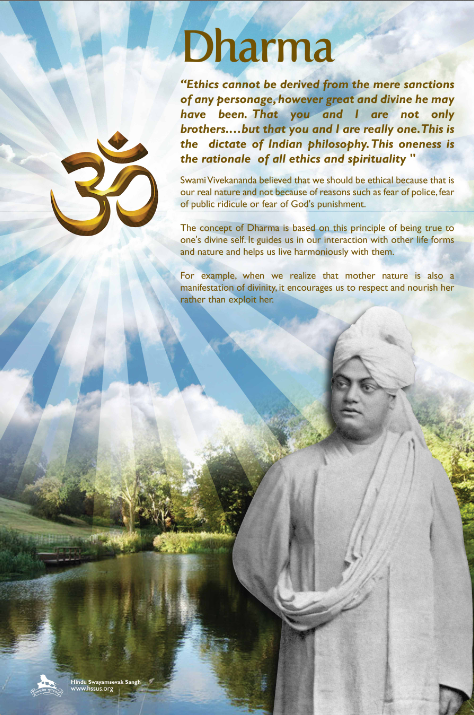 Swami explained to him that he was a trustee of the money and his duty was to do good to the world. Rockefeller did not seem to be impressed. A few days later he returned with a changed mind and heart. In his hand, was a document that had his plans to donate money by creating public institutions. This was Rockefeller's first large donation to public welfare. Later, as the richest man in the world, he would also become a legendary philanthropist who would go on to define the structure of modern philanthropy. 'The iconic author J D Salinger was immensely influenced by Swami Vivekananda. He came in contact with Vedanta, at a time when he had begun to sink into depression. Vedanta not only satisfied his intellectual quest but also offered him solace. Vedantic thought would make way into his future writings especially his novels like 'Franny and Zooey' and 'Hapworth 16, 1924'. George Harrison was probably the most spiritually oriented among the Beatles. His quest to learn Indian music brought him in contact with Indian spiritual ideas, especially the teachings of Swami Vivekananda. He found that Indian music was tied into the spiritual life and one could not get seriously involved in it without knowing what is behind it. 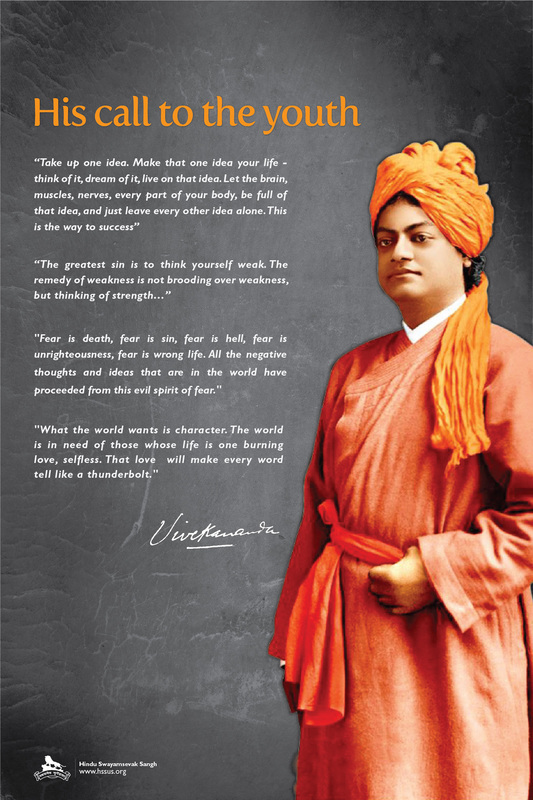 He would often quote Swami Vivekananda's words that first inspired him "Each should is potentially divine. The goal is to manifest this divinity". Indian spiritual ideas would influence not just his music but the way he perceived it.
' 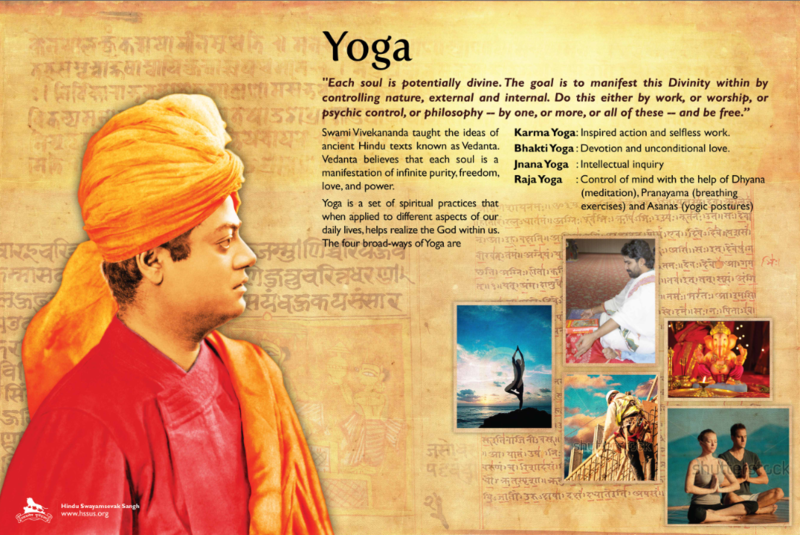 Swami Vivekananda has been called the "pied piper of the Global Yoga movement". 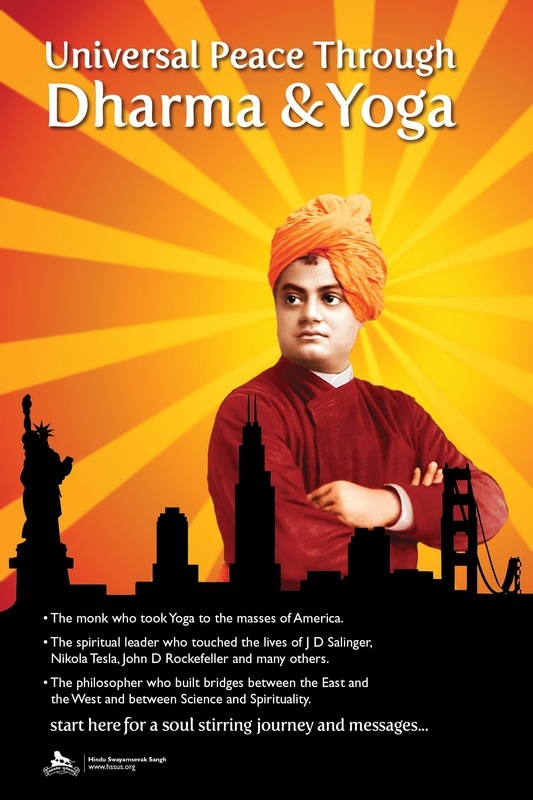 His visit to America led to the popularization of Yoga in America. Today more than 16 million Americans have made Yoga part of their daily lives through meditation, breathing exercises, postures and other techniques. "Fear is death, fear is sin, fear is hell, fear is unrighteousness, fear is wrong life. All the negative thoughts and ideas that are in the world have proceeded from this evil spirit of fear." "What the world wants is character. The world is in need of those whose life is one burning love, selfless. That love will make every word tell like a thunderbolt." 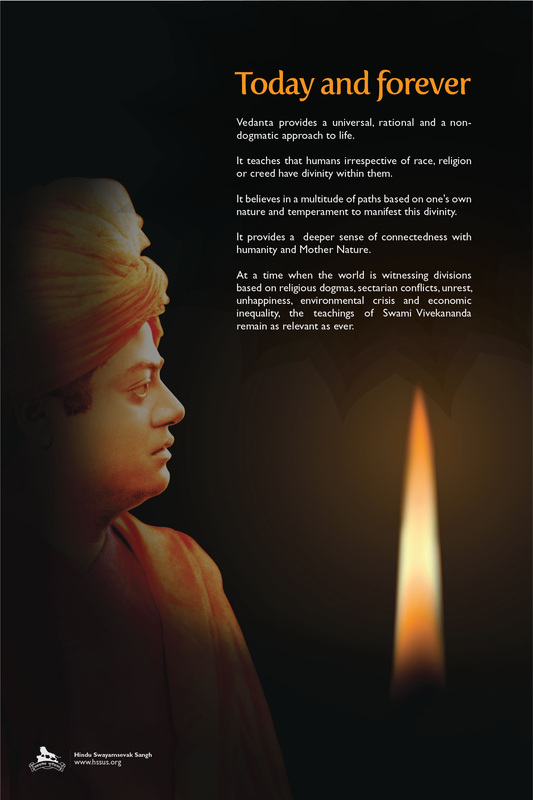 'Swami Vivekananda portrayed Indian civilization in proper light which filled Indians with confidence and united them. It created a sense of mission in the Indian people. This fueled the nascent freedom movement in India and gave it an ideological foundation. 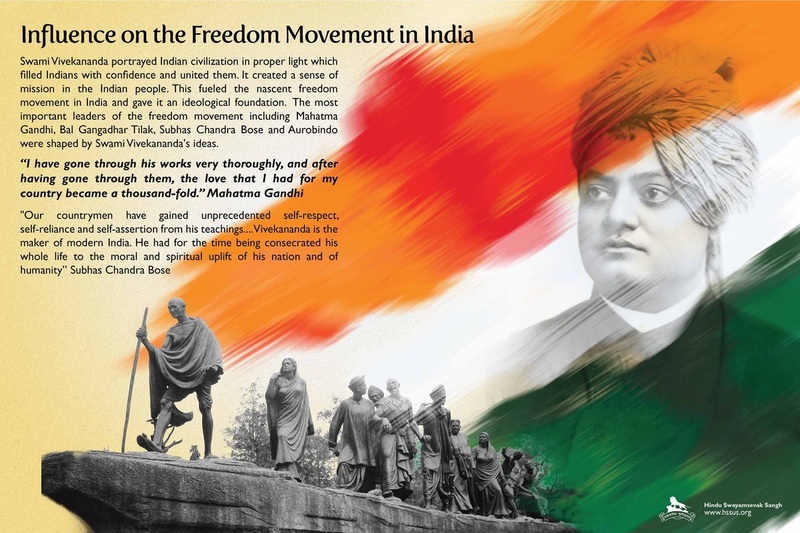 The most important leaders of the freedom movement including Mahatma Gandhi, Bal Gangadhar Tilak, Subhas Chandra Bose and Aurobindo were shaped by Swami Vivekananda's ideas. "Our countrymen have gained unprecedented self-respect, self-reliance and self-assertion from his teachings.... Vivekananda is the maker of modern India. He had for the time being consecrated his whole life to the moral and spiritual uplift of his nation and of humanity” Subhas Chandra Bose . Vedanta provides a universal, rational and a non-dogmatic approach to life. It teaches that humans irrespective of race, religion or creed have divinity within them. It believes in a multitude of paths based on one's own nature and temperament to manifest this divinity. It provides a deeper sense of connectedness with humanity and Mother Nature. At a time when the world is witnessing divisions based on religions dogmas, sectarian conflicts, unrest, unhappiness, environmental crisis and economic inequality, the teachings of Swami Vivekananda remain as relevant as ever. 'Vedanta emphasizes on the multiplicity of religious ideas and spiritual practices based on the diverse natures and temperaments of human beings. Vivekananda affirms that the plurality of religions is not just a fact but that the spirit of pluralism is necessary to awaken thought that make societies dynamic. This Vedantic idea forms the basis of religious diversity and pluralism in Hinduism and has helped keep Hinduism open to debate, change and innovation.